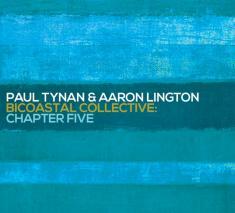 Since joining forces in 2008 as the Bicoastal Collective, trumpeter Paul Tynan and baritone saxophonist Aaron Lington have recorded a series of outstanding albums ranging in instrumentation from tentet to quintet to sextet to a quintet featuring a Hammond B-3 organist. Chapter Five, their fifth album and the first with a full 18-piece big band, adds a sumptuous new volume to the duo's already impressive discography. The new CD will be released May 19 by OA2 Records. As on its predecessors, Tynan and Lington shared writing and arranging credits; each contributed four compositions to the new recording. "Our goal with every project has been to do all-original music, always with a different ensemble," Lington explains. "It's always been our dream to do a big-band record, and we were finally able to make this happen." The result is a highly original take on the trumpet-baritone frontline tradition pioneered by jazz masters who inspired them, such as Thad Jones-Pepper Adams and Chet Baker-Gerry Mulligan. Despite living on opposite sides of North America -- hence the name Bicoastal Collective -- Tynan and Lington have remained friends over the decades since meeting at University of North Texas, where both began work on their master's degrees in 1998 and both played in the school's One O'Clock Lab Band a year apart. (Tynan now lives in Antigonish, Nova Scotia, where he's a Professor at St. Francis Xavier University, while Lington is Coordinator of Jazz Studies at San Jose State University in California.) They started recording together when both were in San Jose in 2008 and, on Lington's recommendation, Tynan spent a sabbatical year teaching at San Jose State and Chabot College and playing around Northern California with the likes of Poncho Sanchez, Keely Smith, and, of course, Lington. Arranging for the session to take place at the mid-continental point of Dallas (also close to their alma mater in Denton), Tynan and Lington recorded Chapter Five over two days in July 2016 with 16 handpicked players. "We wanted to record an album featuring all the people who we really trusted with the music," says Tynan. "A lot of them are our best friends, people we've worked with in the past or some we went to school with." The music on Chapter Five ranges from "Two Views," an extremely swinging Lington composition that finds Tynan and drummer Stockton Helbing in an inspired musical dialogue over the band's aggressive ensemble work, to "I Remember Every Day," which features solos by Lington and guitarist Noel Johnston and was inspired by a hypnotic groove by drummer Omar Hakim. Tynan penned "Charting Stars," which features his warm solos on flugelhorn, as a showcase for David Lown's soulful tenor saxophone. Tynan's ballad "Karma's Song" spotlights Lington's rich, at times biting baritone saxophone solo over the lovely ensemble arrangement. Paul Tynan was born in 1975 in Fort Erie, Ontario. The family moved to Houston when he was 5 and to Buffalo when he was 13. He took up the trumpet in the sixth grade. At the Crane School of Music/SUNY in Potsdam, New York, he studied with trombonist and composer Bret Zvacek and heard some of the university's jazz groups. He didn't begin playing jazz, however, until he met trumpeter Tim Hagans during a trip to Sweden. Aaron Lington was born in 1974 in Houston and raised in nearby Highlands, Texas, where he played piano, violin, and guitar before taking up alto and baritone saxophones in high school. While doing his undergraduate work at the University of Houston, he did a number of short tours with rock 'n' roll legend Bo Diddley, with whom he played tenor sax. After earning his master's in 2001, Tynan began working at St. Francis Xavier University, where he presently teaches jazz trumpet, jazz history, and arranging. His arrangements, many of which have been recorded by college jazz bands, are available from Maxwell Tree Music, Eighth Note Publications, UNC Jazz Press, and Walrus Music Publishing. After receiving his doctorate from North Texas in 2004, Lington accepted his current position at San Jose State University. His charts have been performed by the Maynard Ferguson's Big Bop Nouveau and the Count Basie Orchestra, as well as by the Pacific Mambo Orchestra, in which he plays. 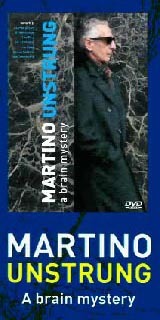 Four of the numbers on the 19-member mambo orchestra's 2014 Grammy Award-winning debut album were arranged by Lington. Tynan feels Chapter Five is the finest recorded example to date of the unique trumpet-and-baritone sax style he and Lington have created. Now that they've recorded their dream big-band album, the two are already talking about the Bicoastal Collective's next chapter: a trumpet-baritone-bass-and-drums set with no pianist using the same instrumentation Mulligan's famous piano-less quartet but in their own distinctive style. Chapter Six and counting.